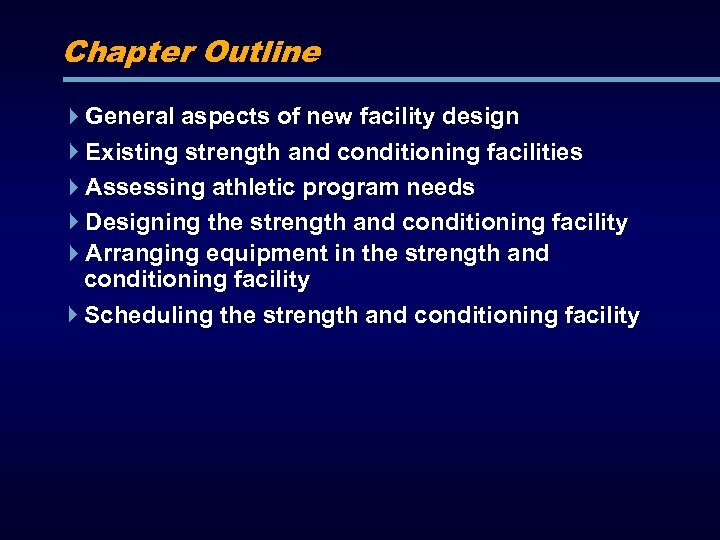 Forming a committee of professionals is the first step in planning and designing a new strength and conditioning facility. 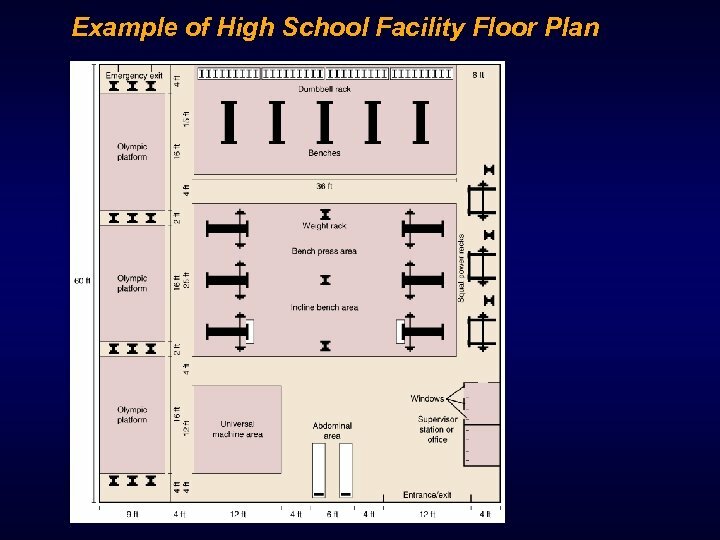 The committee can consist of an administrator, architect, contractor, lawyer, student athlete, sport coach, instructors who will use the facility, and various sport-conditioning experts. 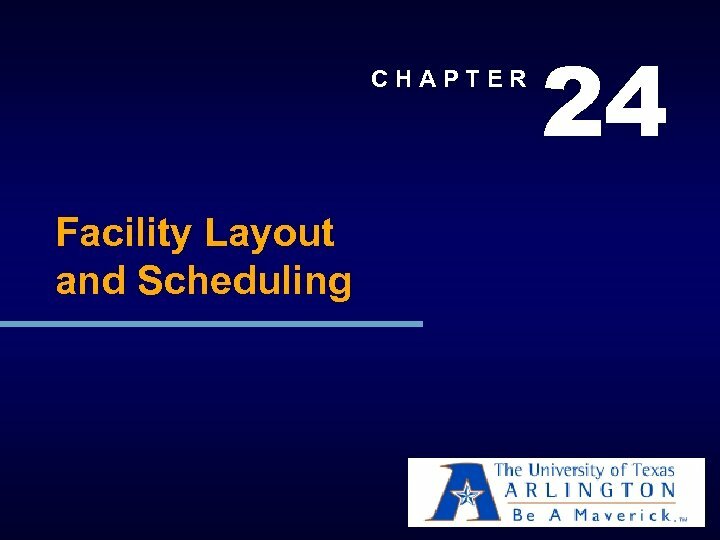 Planning and Designing of Facility Predesign phase requires 25% of the total project time (about 6 months). Design phase requires 12% of total project time (about 3 months). Construction phase requires 50% of total project time (about 12 months). 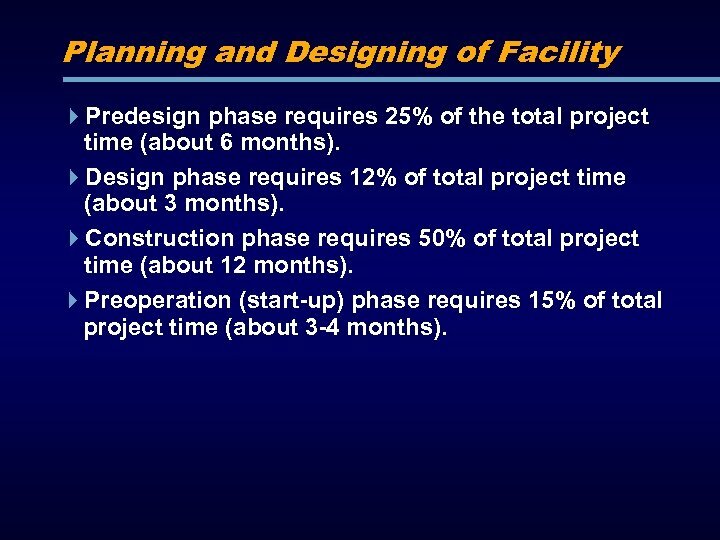 Preoperation (start-up) phase requires 15% of total project time (about 3 -4 months). 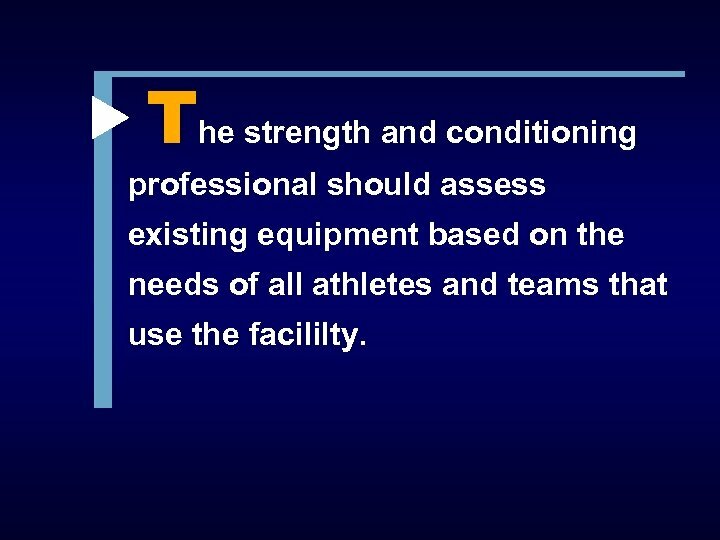 The strength and conditioning professional should assess existing equipment based on the needs of all athletes and teams that use the facililty. 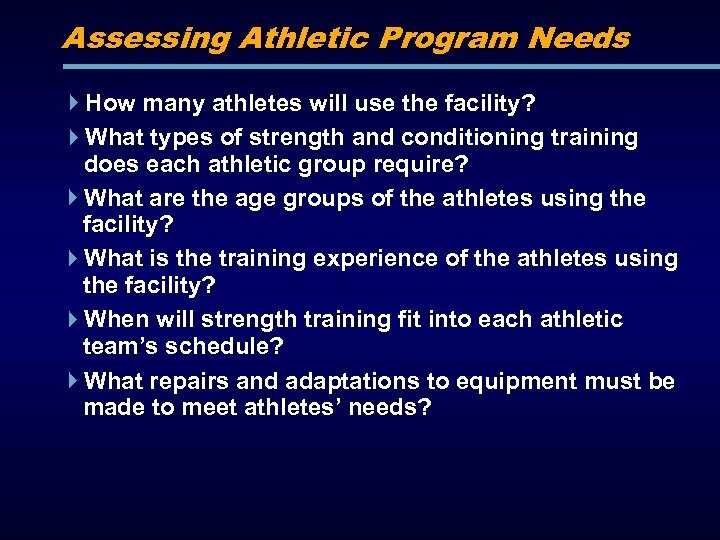 Assessing Athletic Program Needs How many athletes will use the facility? 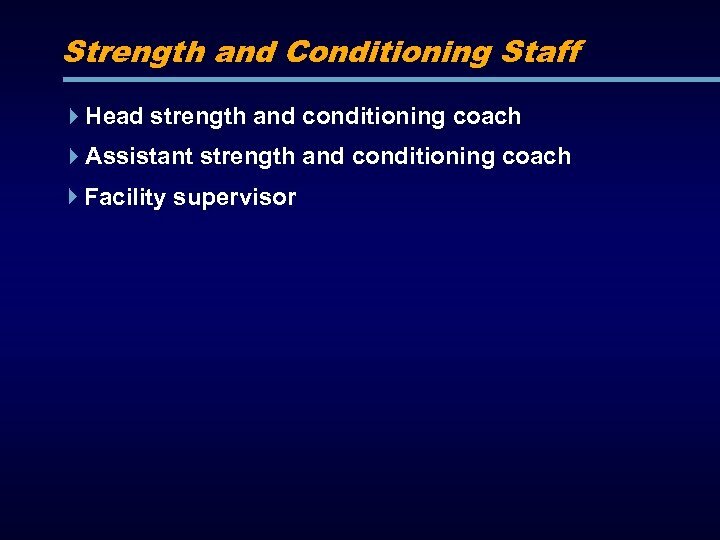 What types of strength and conditioning training does each athletic group require? 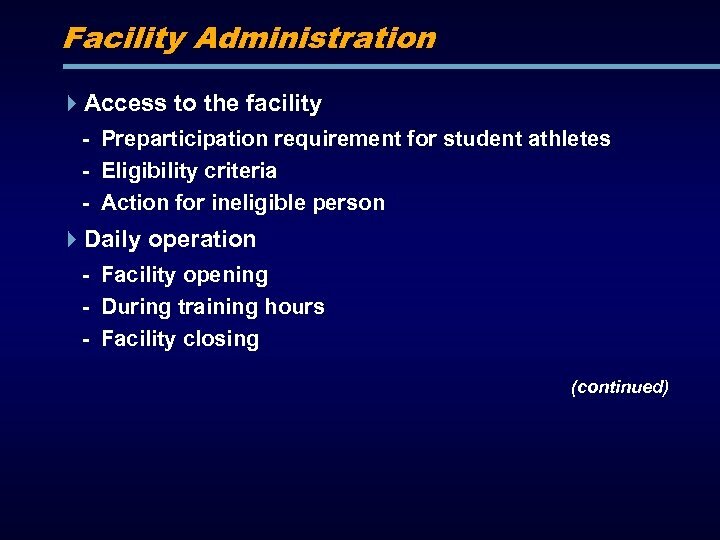 What are the age groups of the athletes using the facility? 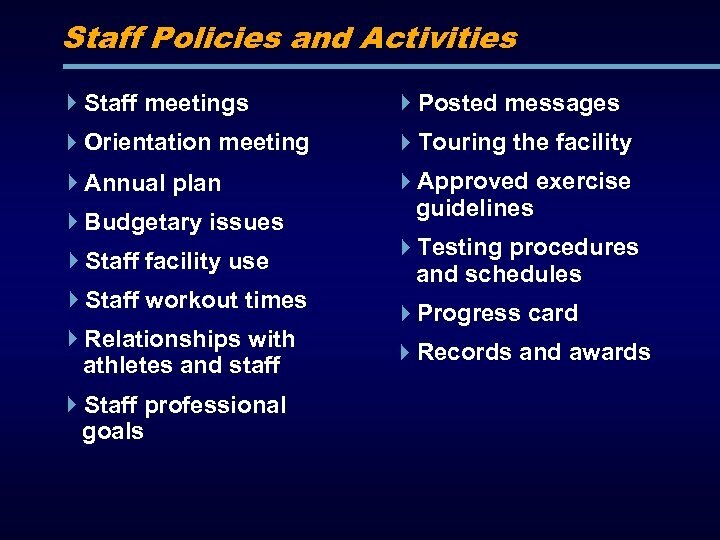 What is the training experience of the athletes using the facility? 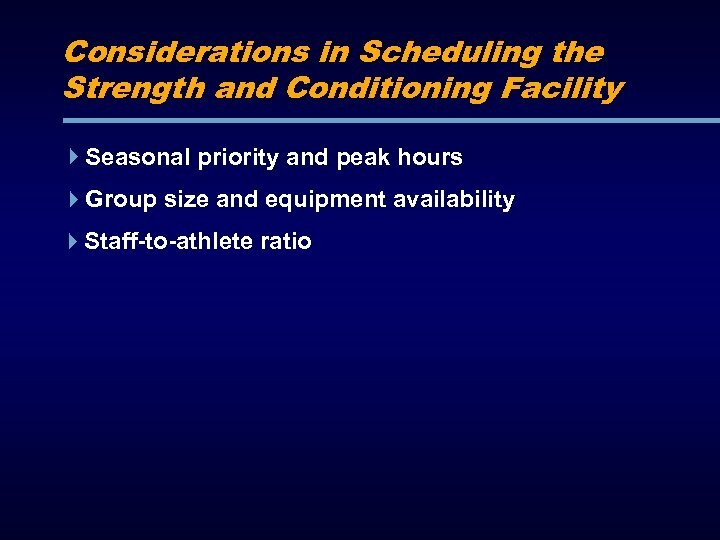 When will strength training fit into each athletic team’s schedule? What repairs and adaptations to equipment must be made to meet athletes’ needs? 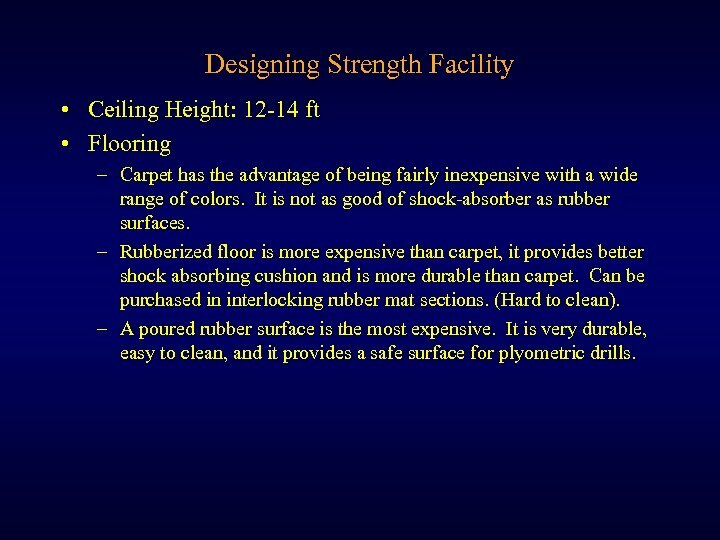 Designing Strength Facility • Ceiling Height: 12 -14 ft • Flooring – Carpet has the advantage of being fairly inexpensive with a wide range of colors. It is not as good of shock-absorber as rubber surfaces. – Rubberized floor is more expensive than carpet, it provides better shock absorbing cushion and is more durable than carpet. Can be purchased in interlocking rubber mat sections. (Hard to clean). – A poured rubber surface is the most expensive. It is very durable, easy to clean, and it provides a safe surface for plyometric drills. 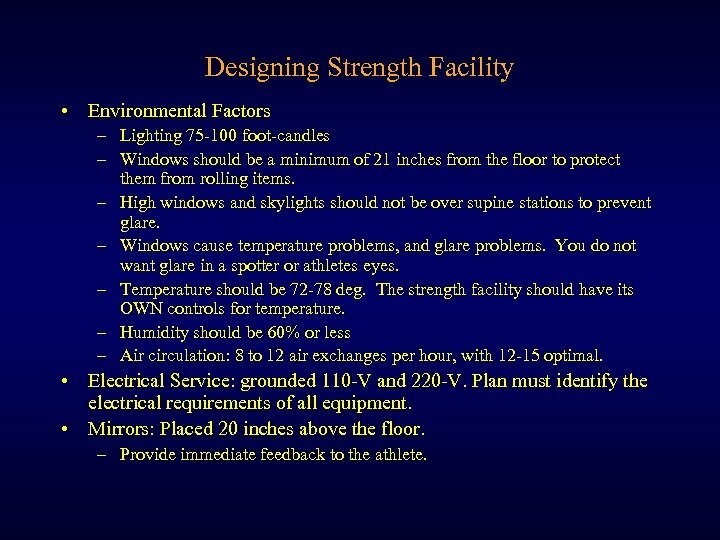 Designing Strength Facility • Environmental Factors – Lighting 75 -100 foot-candles – Windows should be a minimum of 21 inches from the floor to protect them from rolling items. – High windows and skylights should not be over supine stations to prevent glare. – Windows cause temperature problems, and glare problems. You do not want glare in a spotter or athletes eyes. – Temperature should be 72 -78 deg. 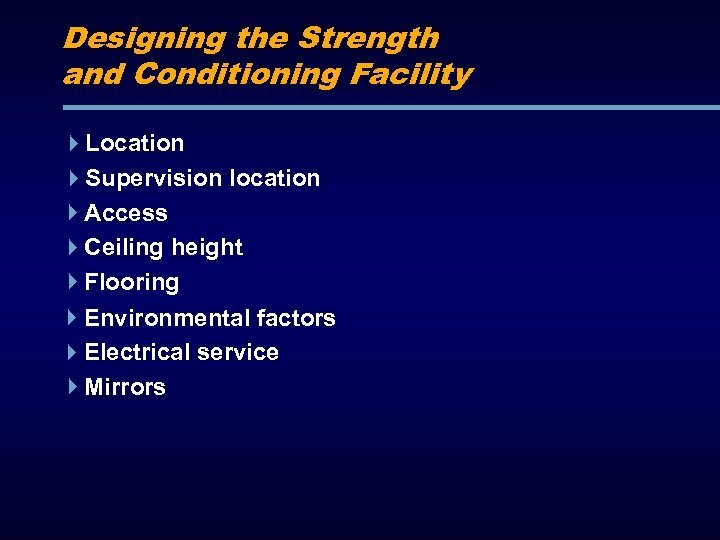 The strength facility should have its OWN controls for temperature. – Humidity should be 60% or less – Air circulation: 8 to 12 air exchanges per hour, with 12 -15 optimal. 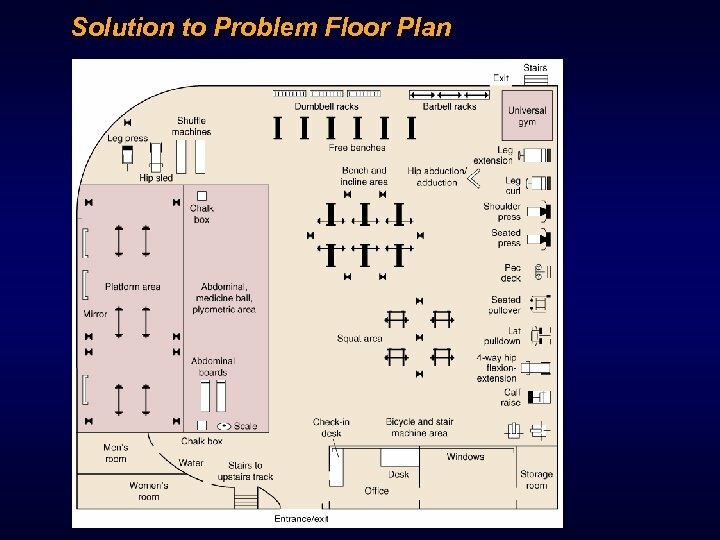 • Electrical Service: grounded 110 -V and 220 -V. Plan must identify the electrical requirements of all equipment. • Mirrors: Placed 20 inches above the floor. – Provide immediate feedback to the athlete. 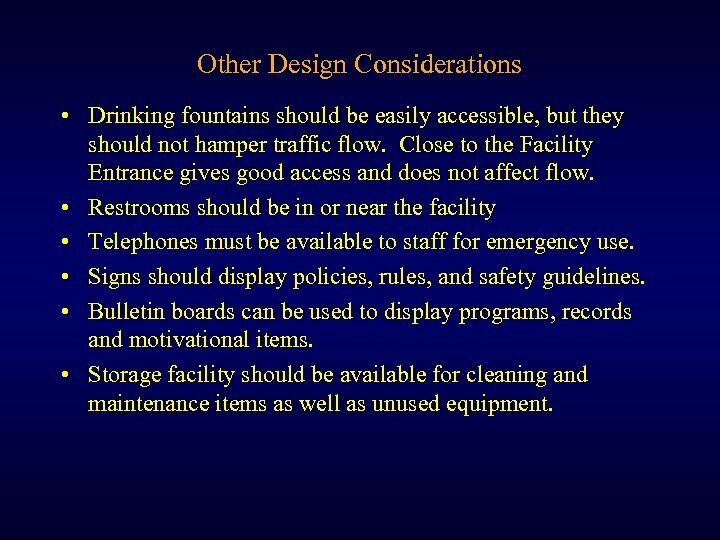 Other Design Considerations • Drinking fountains should be easily accessible, but they should not hamper traffic flow. 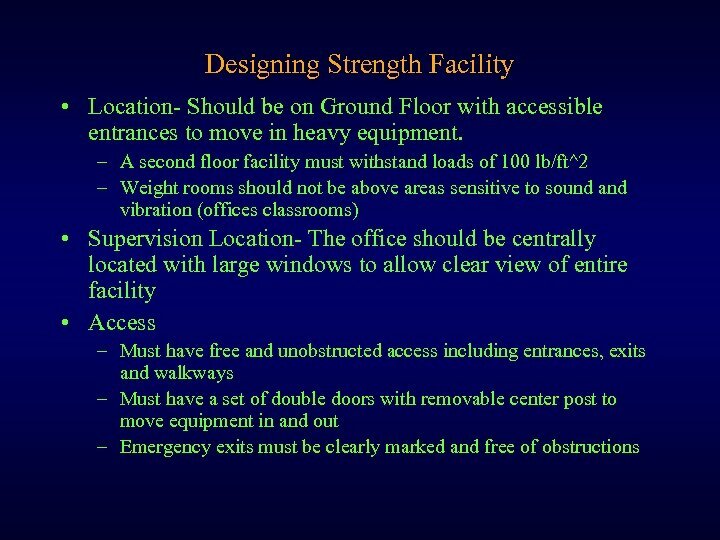 Close to the Facility Entrance gives good access and does not affect flow. 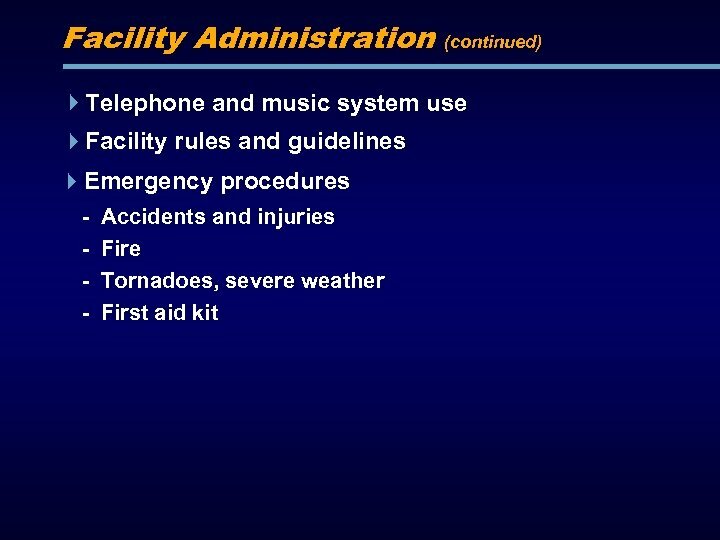 • Restrooms should be in or near the facility • Telephones must be available to staff for emergency use. • Signs should display policies, rules, and safety guidelines. • Bulletin boards can be used to display programs, records and motivational items. 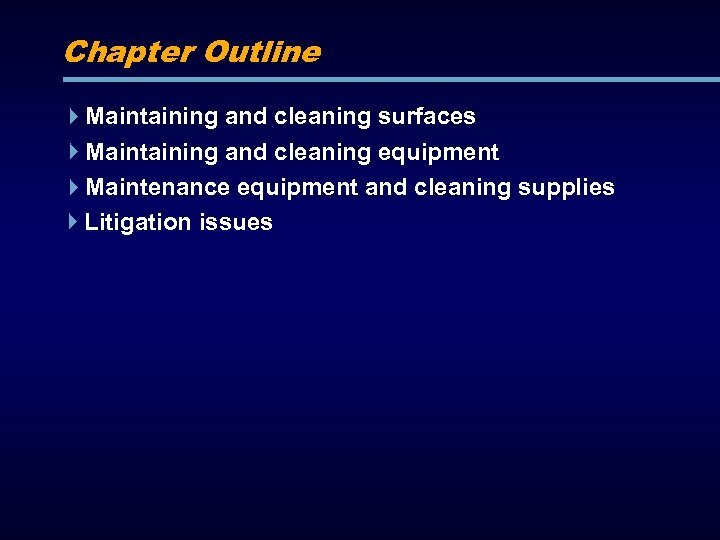 • Storage facility should be available for cleaning and maintenance items as well as unused equipment. 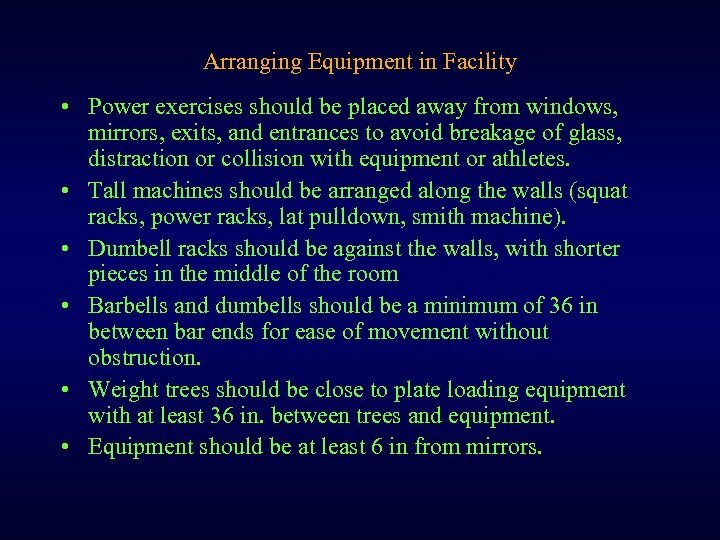 Arranging Equipment in Facility • Power exercises should be placed away from windows, mirrors, exits, and entrances to avoid breakage of glass, distraction or collision with equipment or athletes. • Tall machines should be arranged along the walls (squat racks, power racks, lat pulldown, smith machine). • Dumbell racks should be against the walls, with shorter pieces in the middle of the room • Barbells and dumbells should be a minimum of 36 in between bar ends for ease of movement without obstruction. 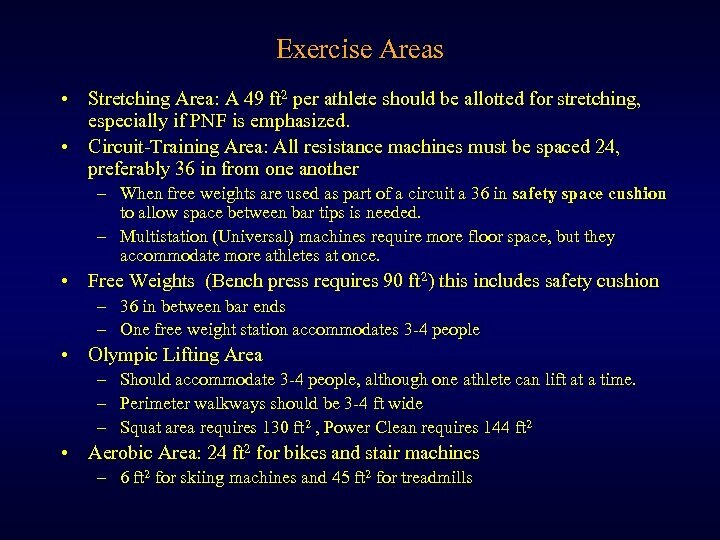 • Weight trees should be close to plate loading equipment with at least 36 in. between trees and equipment. • Equipment should be at least 6 in from mirrors. Traffic Flow • Traffic should flow around the perimeter. 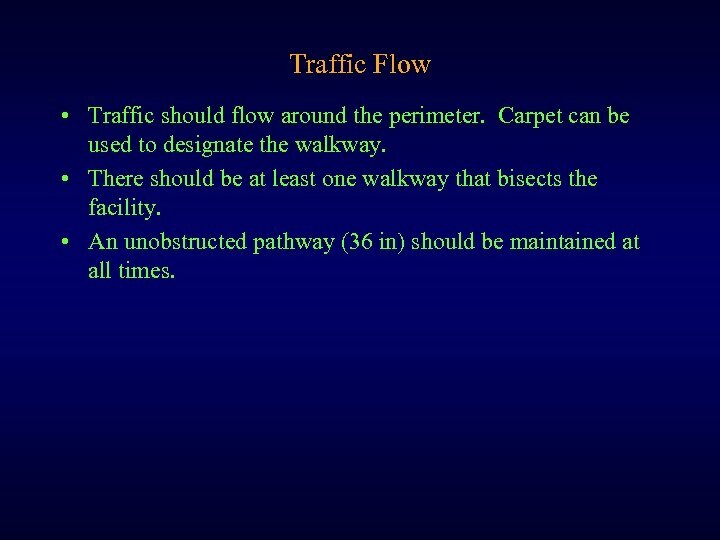 Carpet can be used to designate the walkway. 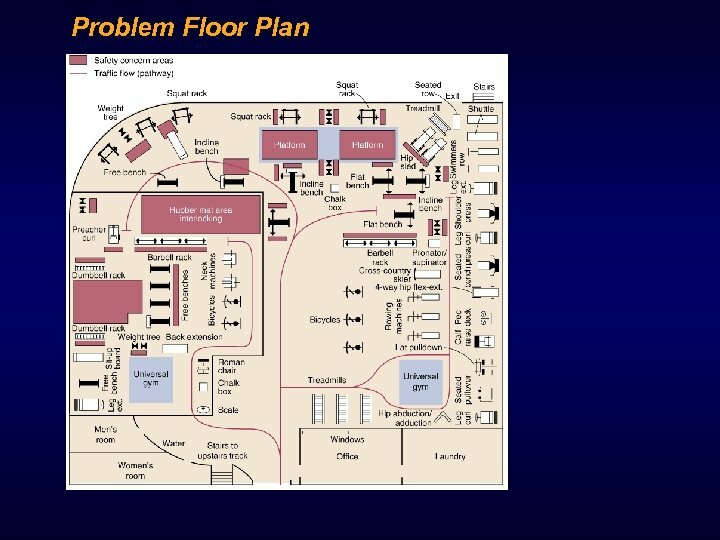 • There should be at least one walkway that bisects the facility. 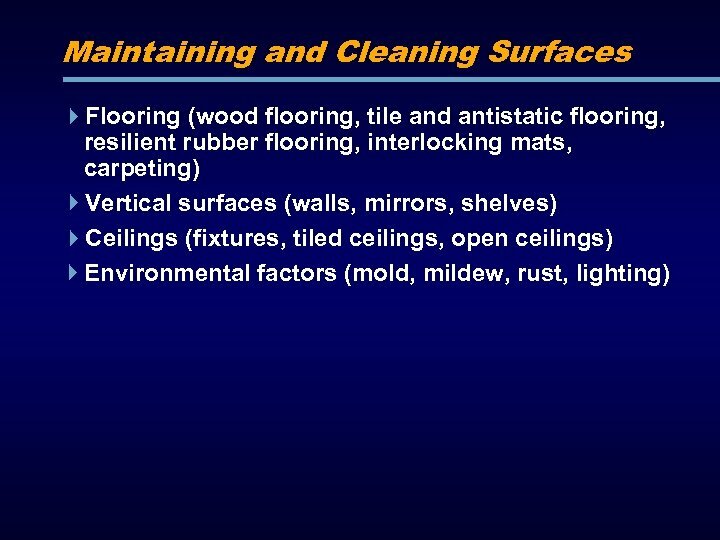 • An unobstructed pathway (36 in) should be maintained at all times. 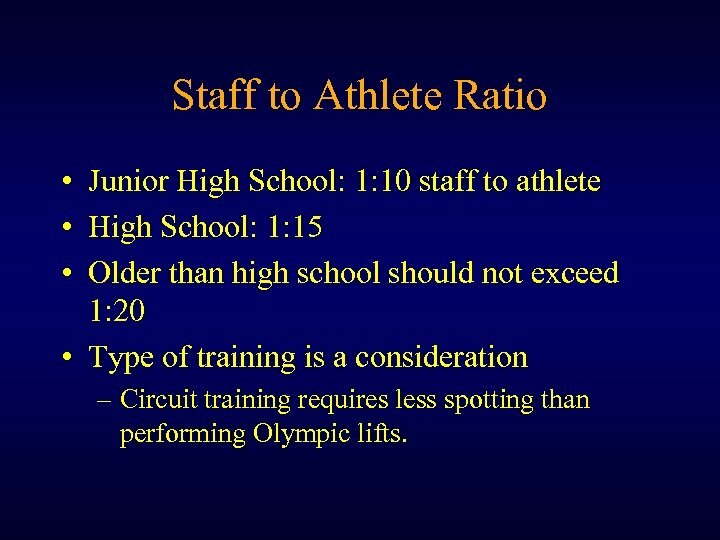 Staff to Athlete Ratio • Junior High School: 1: 10 staff to athlete • High School: 1: 15 • Older than high school should not exceed 1: 20 • Type of training is a consideration – Circuit training requires less spotting than performing Olympic lifts. 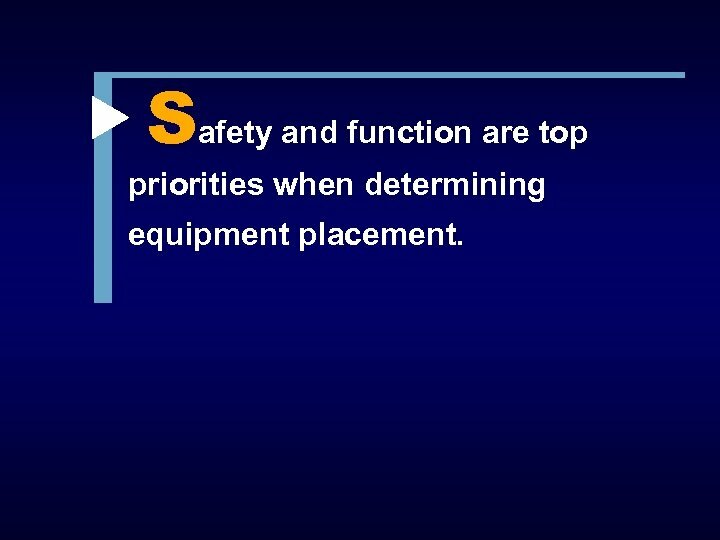 Safety and function are top priorities when determining equipment placement. 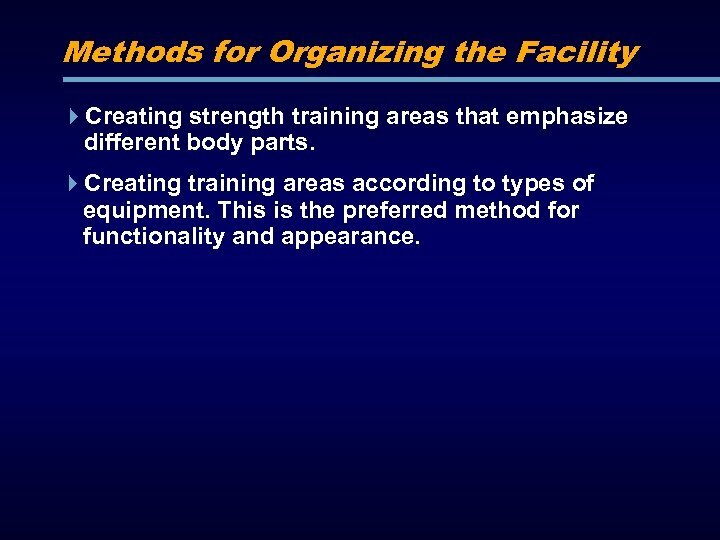 Methods for Organizing the Facility Creating strength training areas that emphasize different body parts. 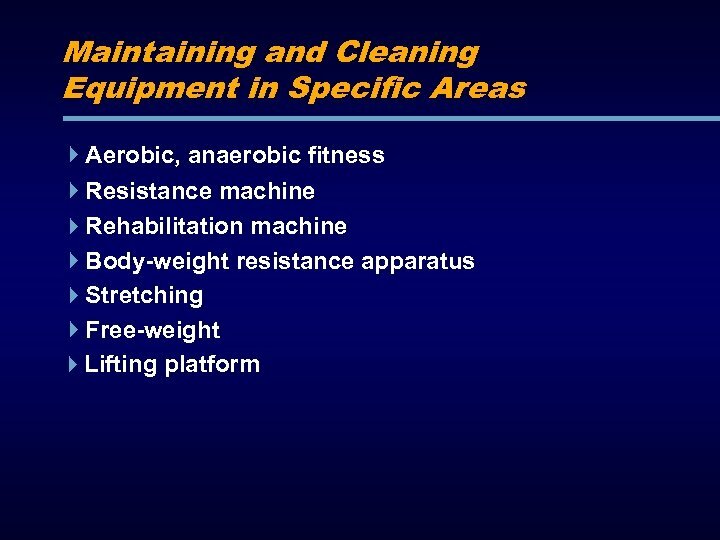 Creating training areas according to types of equipment. This is the preferred method for functionality and appearance. 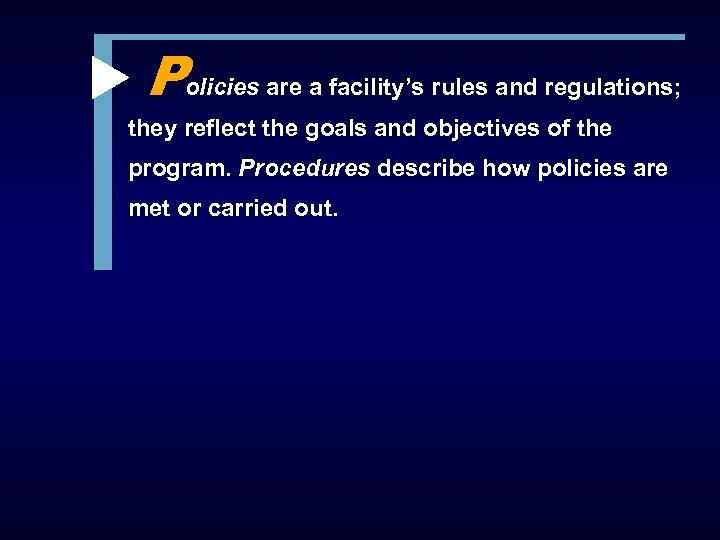 Policies are a facility’s rules and regulations; they reflect the goals and objectives of the program. 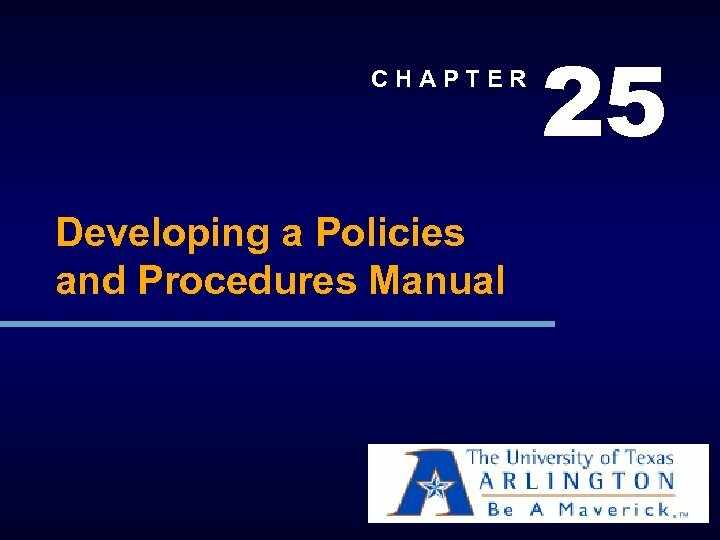 Procedures describe how policies are met or carried out. 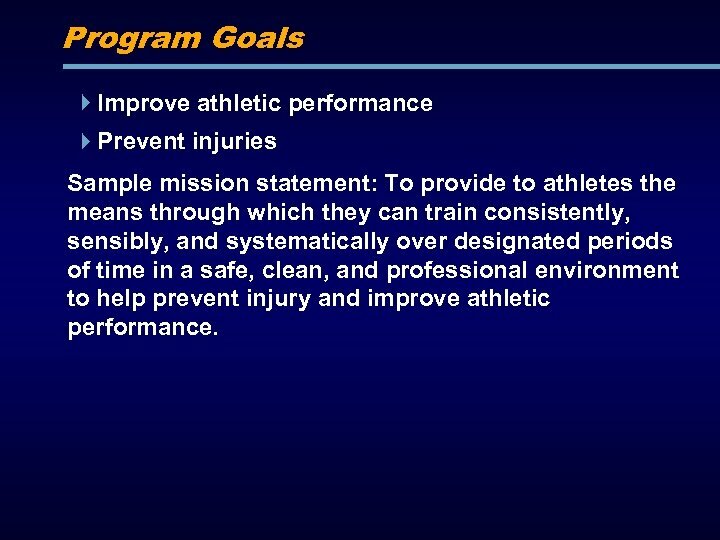 Program Goals Improve athletic performance Prevent injuries Sample mission statement: To provide to athletes the means through which they can train consistently, sensibly, and systematically over designated periods of time in a safe, clean, and professional environment to help prevent injury and improve athletic performance. 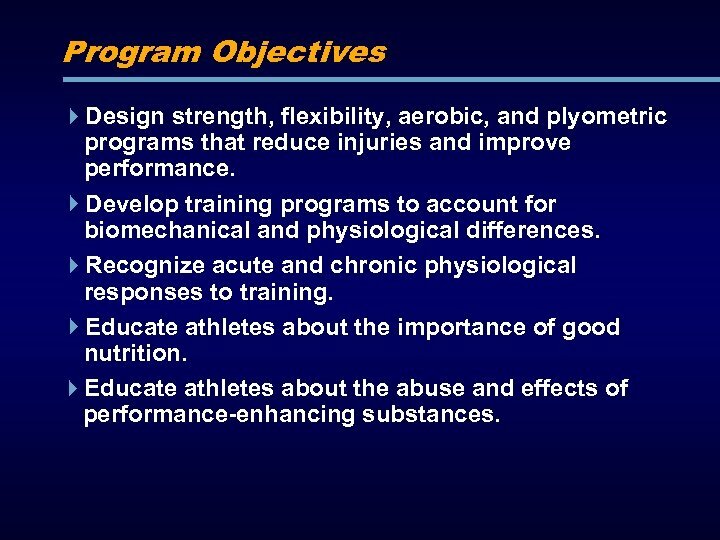 Program Objectives Design strength, flexibility, aerobic, and plyometric programs that reduce injuries and improve performance. Develop training programs to account for biomechanical and physiological differences. Recognize acute and chronic physiological responses to training. Educate athletes about the importance of good nutrition. Educate athletes about the abuse and effects of performance-enhancing substances. 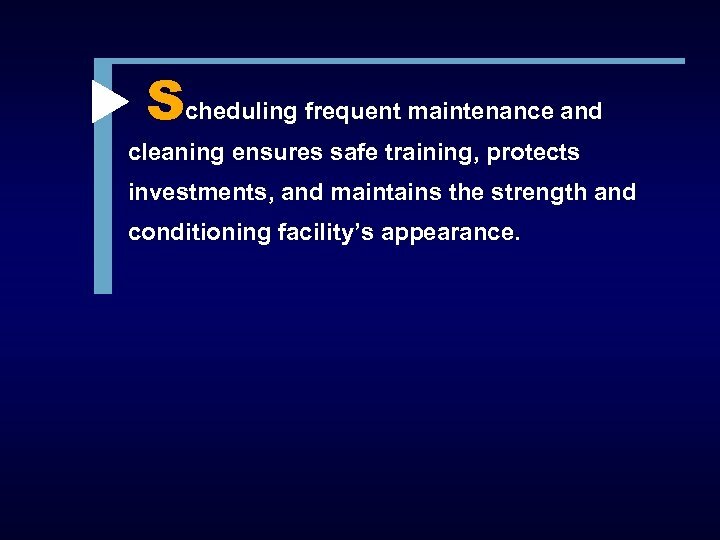 Scheduling frequent maintenance and cleaning ensures safe training, protects investments, and maintains the strength and conditioning facility’s appearance. Keep maintenance equipment in a toolbox located in a locked cabinet or supply closet. 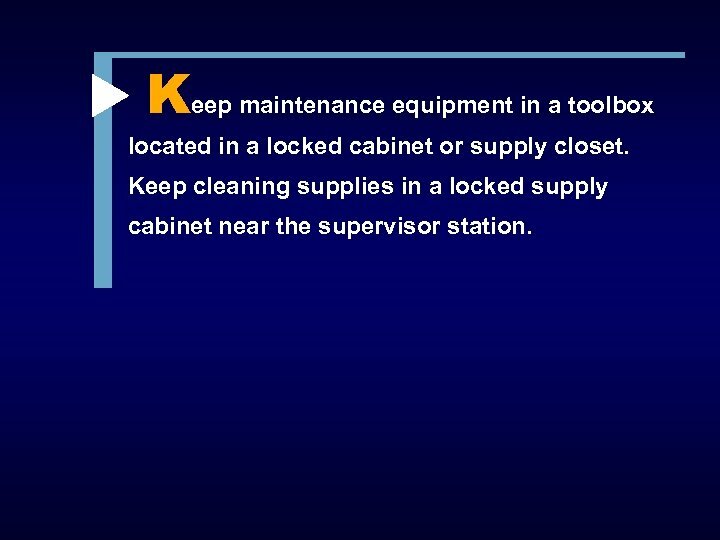 Keep cleaning supplies in a locked supply cabinet near the supervisor station. 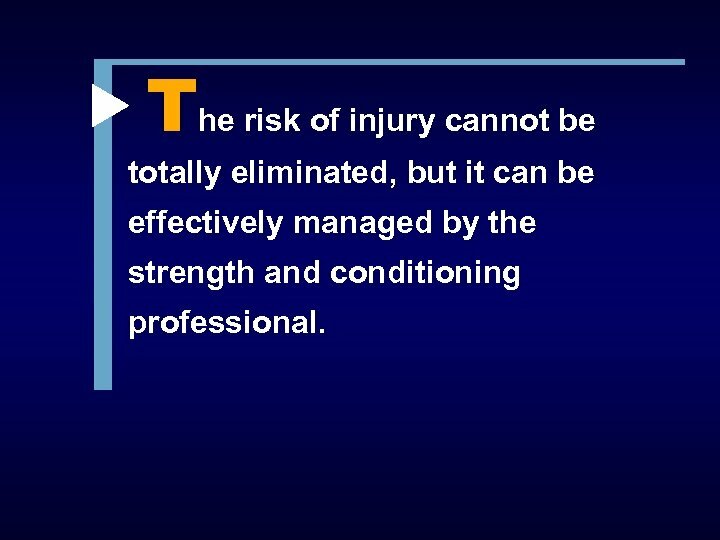 The risk of injury cannot be totally eliminated, but it can be effectively managed by the strength and conditioning professional. 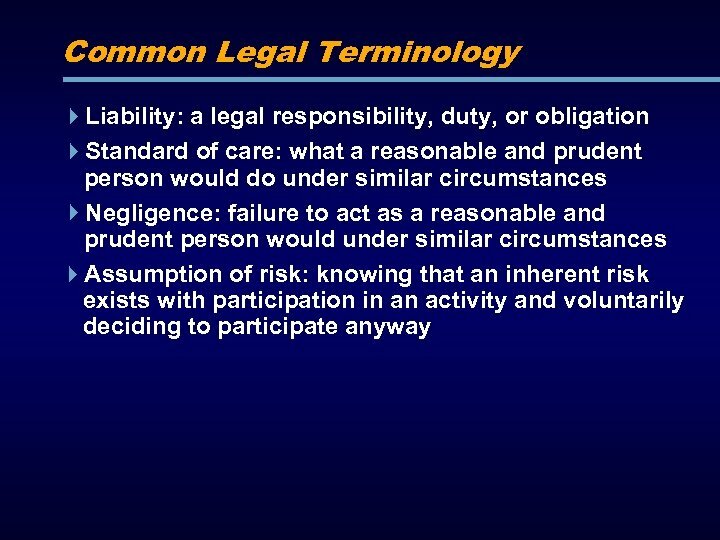 Product Liability Use equipment only for the purpose intended. Be certain that equipment meets standards. Buy only from reputable manufacturers. Do not modify equipment unless such adaptations are designated. 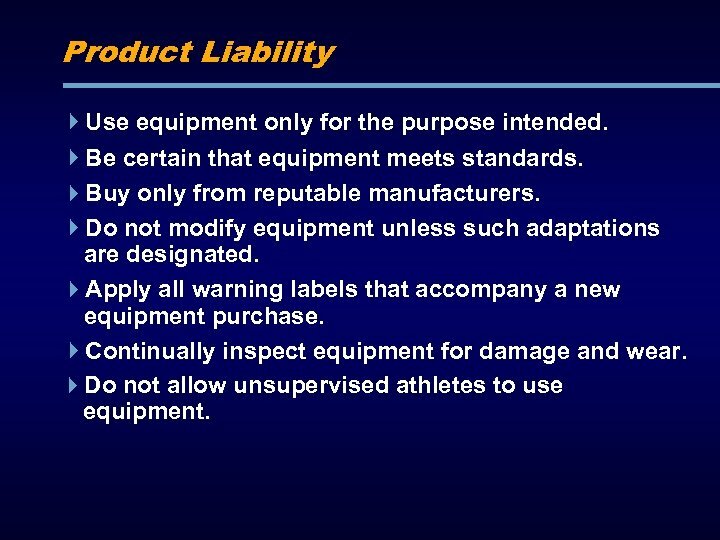 Apply all warning labels that accompany a new equipment purchase. 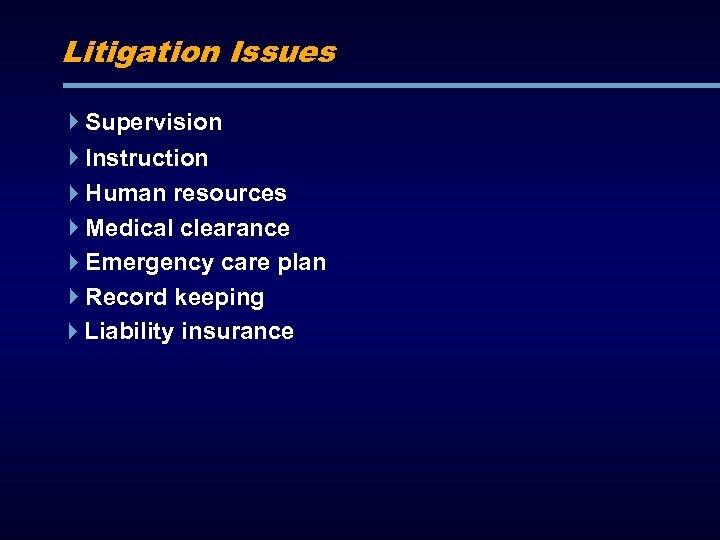 Continually inspect equipment for damage and wear. Do not allow unsupervised athletes to use equipment.